Giveaway Alert! As part of my Blogiversary Celebration this is the third giveaway of the day! 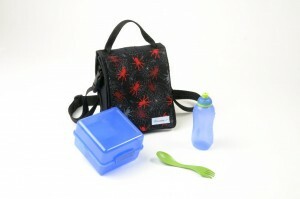 One winner will win a complete everdayjun Waste Free Lunch Kit! Yes, I’m a lunchbox whore! Between my son and I we now have 5 lunchboxes in our collection. What can I say? One is pretty, one is cute, and two are regular store bought boxes. My favorite by far is our newest lunchbox by everdayjun! It’s really hard to find unique lunchboxes for little boys. We are sick of the tv show and movie inspired ones. everdayjun makes these awesome Waste Free Lunch Kits complete with messenger bag style lunchbox (or bag I guess I should say), an awesome sandwhich & snack cube, a reusable bottle, and a spork. While all of the contents are plastic they are all BPA-free and lead-free plastics. I absolutely love the sandwich & snack cube; you can put almost anything in here (unless it’s a liquid…ick!). The best part of the whole kit is the changeable front panel. It’s available in 9 different patterns, each made of pvc-free laminated material. They attach by Velcro so you can change them out as often as you like. The bag is made of neoprene (like dive hear) and is machine washable. When our lunch kit arrived I even got an “awesome bag” out of my husband who said he would take this bag to work! For those of you who don’t know us personally…he’s a manly man and doesn’t like to carry lunchboxes. He still uses plastic grocery bags (we have to get a few each time we’re at the store just for him!) to carry his lunch in. At least I’ve broken him of the baggie addiction. The everydayjun lunch kits sell for $42 for the complete kit. This includes the bag, the cube, the bottle, the spork, and one panel of you choice. Honestly I hate spending that much money for a lunchbox but it’s well worth the investment! This bag has been used almost everyday since it arrived. everdayjun also sells the pieces individually so you can add to your existing lunchbox if you prefer. Win One! One lucky reader is going to receive their very own Waste Free Lunch Kit from everydayjun! You even get to choose the panel! Leave me a comment below (mandatory) telling me which panel you would like if you won! 1. If you read my first post about my Blogiversary you know you can earn an extra entry by leaving me a comment on that post! 2. Facebook Fans! If you aren’t one already become one today and leave me a comment on my Fan Wall about why you want to win a Waste Free Lunch Kit. Leave me a comment below telling me you completed this task. 3. Twitter Followers! If you don’t already follow me…follow me and tweet about this contest. You must include @TheEcoChic and a link back here. Leave me a comment below telling me you completed this task. 4. Add my blog button to your website or blog. You can grab the code on the top in the right sidebar. Leave me a comment with a link back to your page. All Blogiversary Giveaways end on Sept. 23rd at midnight (EST). While you may enter all of the Blogiversary giveaways you may only win one Blogiversary giveaway! Past winners are welcome to enter and win! LEAVE YOUR COMMENTS HERE TO BE ENTERED TO WIN! I would love the Pink Dots. That would be really great! Thank you! I would like the pink dots panel. I commented on your first post! Happy Blogiversary! I left a comment on your first post! I’m a hippie at heart – so the Batik Peace Panel is my fave. I would Love to have this…all my seperate containers don’t seem to fit very well in my current bag. Love the Pink Dots!! The pink dots front panel is my favorite by far! I like the Bad to the Bone Panel. Thanks! I RT’ed your tweet on Twitter about this fantastic giveaway! I would choose the Sugar and Spice panel. on right side under bloggy friends…. I commented on the Blogoversary post! I like the in motion. I commented on the first 2nd blogiversary post.